Far away from the warmth of Mexico, I decided to stop off and see friends in Canada too before I quickly flew home to the UK for London Fashion Week. I'm getting used to this flying alone thing. I headed back to Toronto and Montreal for some *feels like -35* activities - a very difference experience to the plus 30 degrees temperatures I was used to in Mexico but hey, that's the joy of travelling, you can hop on a plane and be in a totally different culture and climate within hours. Let's talk about Winter in Canada... brrr! Toronto was as indie and perfect as always, even when it was hidden in the snow. and naturally turning down a large slice of rainbow cake wasn't on my agenda. and the snow was pretty deep too! My Sorel boots from Daniel Footwear pretty much saved my life in all the snow. I cannot recommend Sorel's enough if you're going to be spending lots of time in a cold climate, I just casually walked through mountains of snow and so many puddles and I didn't get cold or wet - these are like invincible boots. 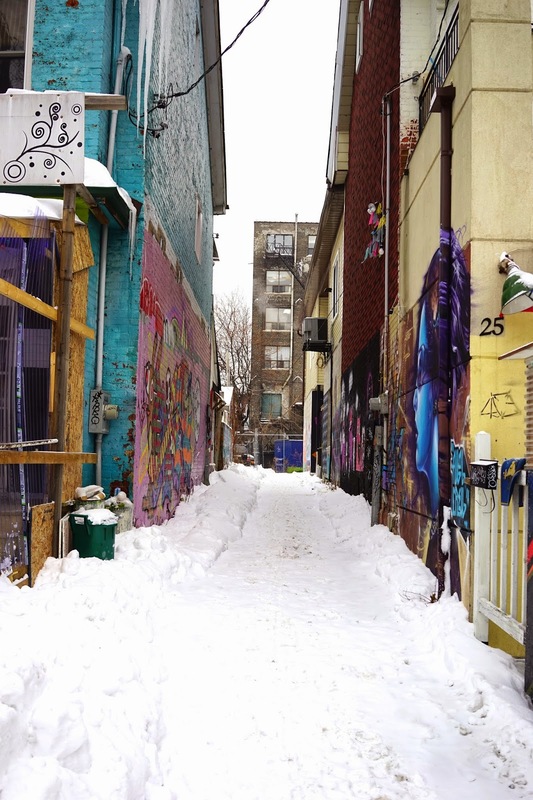 We headed to Montreal and everything was just as beautiful as it was when I left in December. I would love to say I looked super stylish but unfortunately it's hard to look stylish in Canada when your hair turns to ice and you feel like you're going to die of coldness. I bought myself a North Face Parka (I went for the down filled arctic one) and trust me, I needed it. It cost me so much but I honestly think it saved me and allowed me to have fun because I wasn't worrying about how cold I was all the time. I paired this with my snood from Noood London which my hair is covering up on this photo but it's the cosiest, warmest snood which can be used in so many ways. The main problem with Canada weather is, if you breathe onto things your breath turns into ice anyway! delicious maple syrup on a bed of ice. In the evening we headed to Igloo Fest - you may remember this from my Montreal vlog. By day we skated around the frozen lake - it's so crazy that in Summer this was a beautiful lake and people were rowing around on boats - I love how Canadians embrace the Winter and just put their skates on. I absolutely adore ice skating so it's certainly the right place for me! Even though it was colder than -20, we still found some time to make snow angels. My coat and my boots protected me so well (I guess you could say I was just testing them out). I also had thermals underneath from Helly Hansen which are an absolute must have if you're going to a cold climate, they're so good I've been wearing them in the UK too. Do not go to Canada without some good gloves and some good thermals! I actually also think my North Face gloves saved me a few times too, I get the coldest hands in the world but my amazing gloves kept me so warm. You could say the snowfall was pretty heavy. You can see my Noood properly here on this photo. I also went for a walk through my favourite square. 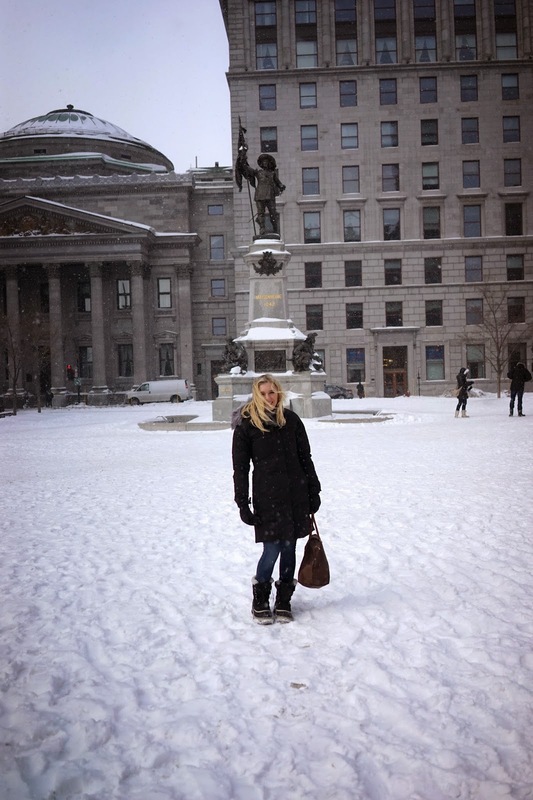 the snow in Montreal was much heavier than in Toronto, thank god for my gloves, thermals and boots! my North Face gloves have straps on so you can keep them around your wrists, this is so good because the amount of times my hands got too warm and I needed to take them off for just a second but then quickly put them back on again! They're a genius invention. and I had so much fun, the next day we did more cross country skiing! It was a little warmer (it was still like -20) so I changed into my gorgeous North Face ski jacket (they have the most amazing ranges) rather than my big parka - um how amazing is the colour? Lots of people on Instagram asked where it's from! I put my Helly Hansen thermals underneath my thick ASOS leggings too to keep me warm! If that wasn't enough for you, you can watch my Toronto and Montreal Winter vlog below too! So there we have it, to be honest, as much as I love the beach, I am more than happy to be ice skating and skiing in Canada too because I just love exploring different cultures and different climates - anything active and adventurous is a winner for me! Going somewhere cold? Make sure you stock up on The North Face and Helly Hansen - trust me, it's a massive investment! Have you ever visited anywhere so cold (it's colder than Mars in Montreal! ), do you like skiing and all things Wintery or would you prefer a beach? Have you ever visited Canada?